Well, I had to give way to the Butterball all-out feasting for a couple of days but now that it’s over, I’m back in the green and sensible eating business. Now, not only did I have fish, veggies and fruit pieces leftover from making the baked tempura, I also had a few tempura pieces that I didn’t get to finish. So I thought of making soup out of all this today. Which turned out to be a winner. The tempura gets soggy when dipped in the soup but that’s how you want it. I’ve never tried making soup out of fruits before and I gotta tell ya, this ain’t gonna be the last time. So yummy and refreshing! Directions: Dice all veggies and fruits into small pieces. In a pot or dutch oven, saute garlic in a little olive oil. Throw in all veggies and fruit pieces, season with salt & pepper and stir. Add just enough stock to immerse everything then add a splash of white wine. Let boil for 10 minutes or until the veggies and fruits are very soft. Ladle the veggie and fruit pieces and some stock into the blender and puree. Pour back into the pot and if needed, re-season to taste. Reheat leftover tempura pieces in the mircrowave. Ladle soup in a bowl, add tempura pieces and garnish with chives or scallions. This magazine I was flipping through the other day had a restaurant ad with a very hypnotic photo of tempura. That got me all excited about my next kitchen project. The only thing is that I forgot that deep frying is a big part of how you make the dish. And deep frying is something I was trying to remove from my cooking vocabulary these days. So, I immediately thought of the possibility of baking it instead. I wasn’t sure if it would work, though. But then again, I’ve made baked tonkatsu in the past with excellent results, so that, at least, gave me some confidence that it might actually work for tempura also. Well, it’s not quite the texture you get when you deep fry it, obviously. As you can see, it’s not as shiny as when it’s soaked in oil. But this is a very acceptable alternative, nonetheless, if health awareness is something you’d consider. 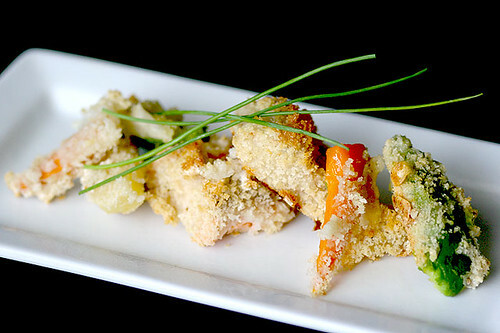 The flavor is authentically tempura. Especially, when you factor in the dipping sauce. Ah… the sauce, yes! Now, this is a whole new ball of wax, I have to say. I’ve tried in the past to make tempura dipping sauce but I couldn’t quite get the authenticity part down. I know because I’ve had it in Japanese restaurants before and there’s always a depth to it that’s more than just soy sauce, rice wine and sugar. But after a little research, I found out that there was yet a missing piece to the puzzle. The chicken stock. Now, why didn’t I think of that? Anyhow, I’m finally pleased that my dipping sauce has come as close as it could to the real thing. But wait! There’s so many ingredients I couldn’t possibly consume this much tempura. Not to worry. I already have something in mind for the leftover veggies. Stay tuned. Ingredients: Seafood (I used Salmon and Catfish),Vegetables (I used Mushrooms, Sweet Potato, Green Beans and Zucchini) and/or Fruits (I used Apple, Pear and Avocado) of your choice, Cooking Oil Spray, Salt & Pepper, Tempura Batter, Ice Cold Water. For dipping sauce: Soy Sauce, Mirin, Chicken Stock. Directions: Preheat oven to 450F. Cut seafood, fruits and veggies into bite size pieces. Place them on a prep tray, spray with cooking oil spray and season with salt & pepper. In a big bowl, mix batter with ice cold water to right consistency. Spray baking pan with cooking oil spray. Dip everything in batter one piece at a time, shaking off excess batter and placing them on the baking sheet. Make sure to not crowd everything together or they will stick. Spray another coat of cooking spray on top of everything to keep from drying. Place pan in oven for roughly 20 minutes. Meanwhile, make the dipping sauce by combining 3 parts chicken stock, 1 part soy sauce and 1 part mirin in a sauce pan. Stir until warm.